The Linx 1010b tablet is a popular option among people who want a Microsoft Surface tablet but are unsettled by the price tag. The Linx 1010b, in the eyes of most people, is a slimmed down Surface tablet with inferior specifications and build quality. But given that it is six times cheaper than the Surface, it is still a very good option for those who want a light and nimble two-in-one machine that runs a full operating system. For those who do not already know; the Linx 1010b is the refined version of the classic Linx 10 tablet. Only this one comes two full USB ports, a mini HDMI port and full Windows 10. Well, given the specs printed on the box, you shouldn’t be expecting this to even run close to the baseline model of the Surface tablets available on the market today. If you’ve picked it up because you want a tablet which can occasionally run as a laptop then you will be pleased by the performance of this machine. Furthermore, if it’s a budget buy as a spare laptop or just something to check emails and browse the web on then you are in good hands. That’s a pretty decent spec sheet for something that retails at £160. For the same price of a low-end Acer Chromebook you are getting yourself a full Windows 10 experience. Storage and technical specs permitting, you can download, install and run all your favourite apps without the gripe of running a niche operating system like Chrome OS. For £160? Superb. The touchscreen has multi-finger support and is sharp and responsive. The tablet has a plastic shell and doesn’t feel premium like an iPad or Surface, but I do trust it to not fall apart. The keyboard, unlike the 3rd-gen Surface Pro is made of keys that resemble a real keyboard. Therefore, it is an absolute joy using this device as both a tablet and a netbook. On top of this, the touchpad on the removable keyboard also support multiple fingers. It is a bit small and cramped, but it does the job. Many users will probably prefer a wireless mouse. If you configure it properly from the Windows 10 settings, the device will automatically switch between laptop and tablet mode when the keyboard is connected/disconnected. In laptop mode, it’s sufficiently powerful. I can quite happily carry out basic programming tasks, video streaming, Skype, word processing and more. I haven’t tried gaming, and I don’t think I will. But that fact that it happily handles my on-the-spot web development work makes this worth every penny of £160. Once I finish up a late-night job on developing a new website and send out an invoice, all from the Linx 1010b in tablet mode: I pull off the keyboard, throw it aside and roll in to bed with the Linx 1010b in tablet mode. Apart from the lack of an official YouTube app, it does everything I need it to for some bedtime browsing. YouTube through Chrome is a bit buggy at times, but bearable. Other apps like Reddit, Twitter and Facebook are more than enough, as well as the built-in calendar and email applications. Two USB ports, mHDMI, MicroSD and an AUX-out. It also features built-in speakers and Mic as well as rear-facing and front-facing 2MP cameras. For £160 you cant expect more – or complain! I am predominantly a Mac user. I did try Windows 10 Preview when Microsoft first announced it, and it was certainly a step in the right direction after the abysmal Windows 8 and Windows 8.1 operating systems. The Linx 1010b comes with full Windows 10 pre-loaded on it’s 32GB built-in flash storage card. First off, you’ll notice that many Windows Store apps will not work (including VLC). You can download the full version from their official websites, but the Windows Store will say that you need a device with advanced features. This is easily solved, however. You’ll need to force an update through the Update Centre to download and install the Windows 10 Anniversary Update (tutorial here). With that installed, you’ll have a much better version of Windows 10 installed with a bunch of new features including improved tablet support! With that out-of-the-way, it’s time to admit that Windows 10 on a tablet… Is pretty good! It’s not perfect. Not all apps can run in ‘tablet-mode’, and not all of them look like they understand the dual-UI of the Windows Metro in tablet mode and then the full Windows 10 mode. But excluding that, it’s actually a good experience. Google Chrome, as expected, drains the battery life of any mobile device. 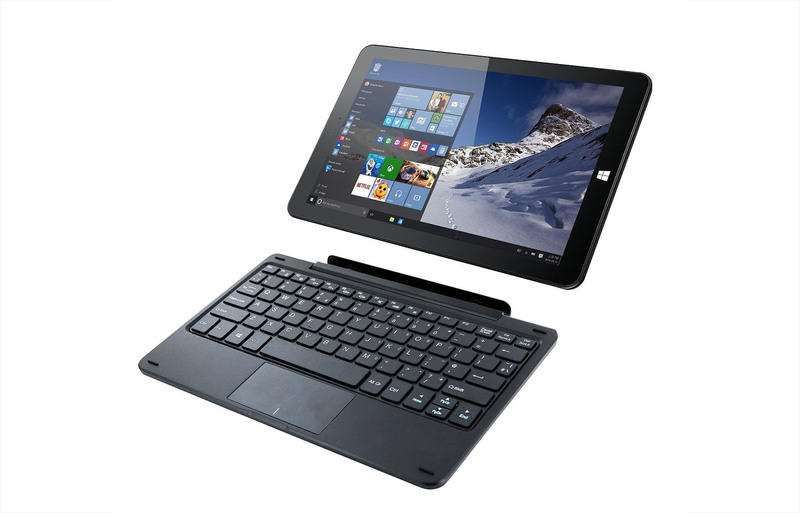 But the Linx 1010b in tablet-mode and with the keyboard attached makes a very competent Windows 10 device. It handles 720p and full 1080p HD video playback on VLC with zero hiccups. Browsing is crisp, and for those who have more demanding tasks it outperforms an iPad for productivity all day long. With Windows 10 Anniversary Update installed, along with VLC, Chrome, Slack, Twitter, Facebook and Dropbox (including personal files) you have about 18GB of storage space to play with. That’s not amazing, and given that you have a full Windows 10 Operating System to play with you’ll find yourself filling it up very fast if you’re not careful. The Linx 1010b supports expandable storage up to 128GB. The MicroSD card slot is concealed behind a flap which means you can leave it plugged in permanently for added storage space. Though you wont get the speeds of an SSD, both the Linx 1010b internal storage and MicroSD are solid-state. This makes the Linx 1010b the ultimate portable media tablet (because it supports VLC which can playback anything! ), but also doubles up as a full laptop for those last-minute tasks in the airport lounge. Given that this tablet costs the same as ‘low-cost’ tablets manufactured by unknown brands in China, I did half expect the battery life to be below par. After all, nobody has heard of Linx prior to the Linx 7, Linx Gaming and Linx 10 tablets. I’m pleased to say the battery life of this tablet is very well-suited to making this a great carry-around machine and laptop replacement. Most of the battery depletion occurred during standby, but this was over a 32 hour period. It shows even with some light usage during the day (or evenings after work) the Linx 1010b is still able to hold some charge. Given that all the hardware inside is solid-state, bootup time is only a matter of seconds so to prolong the battery you could shut it down after using. I think the excessive draining of the battery during standby is largely due to the fact that Windows 10 is not yet fully tablet-ready. Updates to applications such as Cortana, Mail, Calendar, Outlook and others continue running in the background even when the tablet is locked. It took Apple several years to perfect this on macOS, but if Microsoft do address this issue it would make the Linx 1010b a serious contender to replace netbooks and ultra-portable laptops. Once improvement I would recommend here is that the keyboard should house an additional battery pack. It has been weighed down to counter-balance the weight of the tablet. Since it connects to the tablet using a physical connection (and not Bluetooth), it would be a nice touch if the keyboard housed extra power for the tablet to run or charge from. This improvement would also make the heavy keyboard a much more acceptable design.